A new festival is hitting Fresno next weekend-this one especially for students-Renegade: The Fresno Student Fringe Festival. We recently chatted about Renegade with Tony Sanders, who is the Event Producer/Founder and Renegade Director who oversees all aspects of the festival (scheduling, marketing, and recruitment). 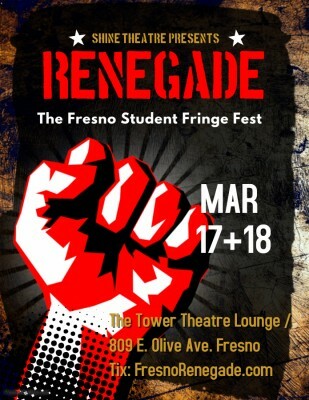 KRL: What exactly is the Fresno Student Fringe Festival? Tony: The Renegade is the first of its kind in the Central Valley: a stand-alone festival dedicated solely to the Student Artist and their work. This platform is designed to allow school groups, student artists, and performers the opportunity to perform every genre from traditional to more avant-garde work. KRL: When and how did the idea come about? Tony: I was recruited to assist in the creation of Kid Rogue in 2014, and it served as an excellent platform for school groups to gain exposure with Rogue audiences. Unfortunately, the Rogue Festival decided to not continue with the program after the 2016 season. As an award-winning arts education entity, Shine! Theatre was the logical choice to create the first stand-alone festival solely dedicated to the Student Artist. KRL: Who all is involved? Is there a specific company involved? Tony: Shine! Theatre is the sole sponsor of the Fresno Renegade. KRL: Is it all volunteer? Tony: Yes. The staff at Shine! is all volunteer, and we are always seeking additional assistance. Interested individuals should contact the office at 559.549.4741. KRL: Why did you want to do this? Why did you feel there was a need? Tony: Student Artists are rarely offered opportunities to present their work in a professional setting, and it’s essential to their growth as an artist. The Renegade also allows them to be involved in marketing, self-promotion, ticketing, and technical aspects. The Renegade is an open forum (censorship free zone), and we do not audition the acts, so The Student Artists are presenting their work without restrictions. They are also responsible for setting ticket prices and promoting their work. KRL: How long did it take, from planning, to actually happening? Tony: Shine! has had the idea of launching a student festival since 2015. We were well versed in running festivals and felt ready to branch out. Having helmed Kid Rogue for three seasons and overseeing the talent coordination for the Fresno Art Museum Maker Faires gave us a good sense of what was necessary for a successful event. KRL: What type of acts are you expecting? Tony: Musicians, school choirs, dance, magicians, sketch comedy, and team improv. KRL: Will it all be local? Tony: Yes, it will be, given that this is the inaugural event. Moving forward we’d be thrilled if/when we begin pulling from outside of the valley area! KRL: What ages are allowed to perform? KRL: How many acts will there be? Tony: We have eighteen forty-five minute performance slots available and large acts (three or more performers) are able to reserve up to three slots. We have also created Emerging Artists slots (10 minutes) for soloists and duos. KRL: Where will it be taking place? KRL: What are the dates and times? KRL: Do you have a website and social media? KRL: How do people go about purchasing tickets? Tony: Tickets can purchase tickets directly from the website or at the door (depending upon availability). Tony: These students need our support! Please come out and see their work. If we truly care about the future of the arts, we absolutely must support tomorrow’s artists…today!